Cut kale into 2 inch squares or strips after removing stems. Ground English walnuts are rich in omega 3. Mix oil and seasonings well into the kale by hand. Seasoned kale ready for the dehydrator. Yes, You Heard Me Correctly, Kale Chips! The first time I heard about kale chips, I was skeptical. But like so many others, I was hooked after my first bite! There are lots of recipes for these. Some people bake them in the oven while raw foodists dehydrate them to preserve their enzymes and nutrients. I dehydrated most of mine but I also tried baking some in the oven at 200 degrees and both techniques turned out great chips. They taste amazing and could possibly could be the healthiest snack on the planet! As I've told you in past posts, kale is truly one of the most nutrient dense foods around. Read more about kale and see more of my kale recipes. This recipe is a simple combination of my favorite Italian ingredients (garlic and EVOO, of course) with a big focus on omega 3. To maximize this essential fatty acid, I add some flaxseed oil and English walnuts yielding a whopping 2 grams of omega 3 per serving! See more Raw English Walnut recipes high in omega 3. But you can make this recipe to suit your tastes. Instead of garlic powder, try using cumin, turmeric, curry or chili powder. For ground nuts, you can substitute raw ground almonds, brazil nuts, sunflower, hemp or sesame seeds for the walnuts. You can also mix in some nutritional yeast for a cheesy flavor. Nutritional yeast is especially high in B-complex vitamins, protein and a host of other nutrients. See more recipes and information on nutritional yeast. Kale chips make a great snack for Superbowl Sunday (coming soon!). Try some of these other delicious and healthy snacks and appetizers like Raw Vegan Walnut and Mushroom Pate, Raw Hummus with Sprouted Garbanzo Beans, Cherry Tomato Salsa, Roasted Tomato and Mango Salsa with Arbols, Vegan Antipasto, Raw Vegan Walnut and Spinach Pesto Stuffed Mushrooms and Guacamole and Raw Jalapeno Corn Chips. Grind the English walnuts in a food processor, VitaMix or coffee grinder (one that is not used for coffee) and set aside. Clean and remove center stems from kale. Cut curly kale into 2 inch squares. If using dinosaur kale, cut into longer strips. Put in a large bowl. Combine flaxseed oil, extra virgin olive oil, lemon juice, salt and garlic powder and mix well. Add mixture to the kale and rub into the kale with your fingers. Mix in the processed walnuts. When thoroughly combined, put on Teflex sheets. It should take 2 to 3 sheets depending on the type and size of kale. Dehydrate at 115 degrees for 6 to 10 hours or until crisp and dry. This time could vary so check occasionally. If you dehydrate at a lower temperature, it will take longer. If you don't have a dehydrator, put your oven on the lowest setting. I baked some at 200 degrees for 30 minutes and it came out perfect but check your kale OFTEN because these can overcook in a hurry. Per serving: 119.9 calories, 8.3 g fat, 0.9 g saturated fat, 0 mg cholesterol, 3.6 g protein, 10.1 g carbohydrates, 1.8 g fiber, 2.0 g omega 3 and 3.3 g omega 6 fatty acid. 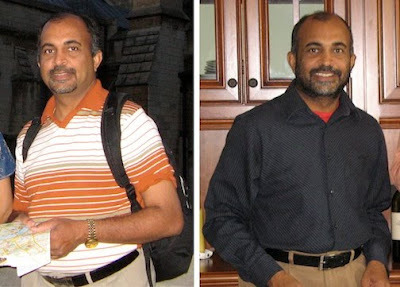 Kannan before and after a 41 day raw food diet -27 pounds lighter. A festive dinner blend of raw food and traditional Indian Cuisine. I met Kannan when we were both high Tech CEOs in Silicon Valley. We were members of a small group called “CEO Leadership Forum”. The group met monthly to discuss our businesses but we often talked of our personal interests and passions. Since I was also going to school and working on my PhD in Holistic Nutrition, specializing in Raw Food Nutrition, I would often speak to the group about raw food diets. Kannan and others were always politely inquisitive (of course you never know when people are really interested or if they think you are crazy when you talk about raw food diets). When I left Silicon Valley two years ago to devote my time to studying and writing about nutrition, I remained friends with Kannan and his wife and we stayed in touch. I made sure to send them an email each time I posted a new article or recipe on my blog. At 5 feet, 5 inches and 166 pounds, Kannan had an unhealthy Body Mass Index (BMI) of 27.6. BMI is an indicator of total body fat that is related to disease and death. For a healthy BMI between 18.5 to 24.9, he should never weigh more than 149. Calculate your own BMI. Even with a mostly vegetarian Indian diet, Kannan’s cholesterol profile was disappointing. Total cholesterol and LDL were high and HDL, his good cholesterol, was too low making his cholesterol/HDL ratio an undesirable 5.0. To have a “low risk” of cardiovascular disease, you want a ratio of 4.0. A ratio of less than 3.4 would be an indication of a “very low risk”. I encouraged him to also get tested for CRP and homocysteine that I believe are better markers for cardiovascular risk. None-the-less, the doctors would like to see an improvement in his cholesterol. Kannan had very high triglycerides. Many people who suffer with diabetes or heart disease have high levels of triglycerides so this is a very important indicator. Over the past 4 years, Kannan’s levels have been as high as 268 and never below 162. Normal is less than 150 mg/dL. High triglycerides combined with high LDL or low HDL (Kannan had both) are associated with a faster build up of atherosclerosis. Artherosclerosis, which is the buildup of fatty deposits in arterial walls, can increase the risk of getting a stroke or heart attack. High blood glucose levels is an indicator that your blood sugar is not getting taken into the cells adequately and could be a sign of “insulin resistance”. Insulin is a hormone made in the pancreas that helps the body assimilate glucose for energy. Insulin resistance is where the body is not using insulin properly causing the pancreas to have to significantly increase its production of this hormone. When the pancreas finally gives up trying to keep up with the body’s needs, the level of sugar in the blood rises. This eventually leads to diabetes. Normal fasting blood sugar levels fall between 70 and 99 mg/dL. Kannan’s levels were a dangerous 146 mg/dL and had been as high as 193 mg/dL in a test taken several years ago. Kannan had met the criteria for both triglycerides and fasting glucose and was on the borderline of 40 mg/dL for HDL. This is why his doctor warned him of metabolic syndrome! Clearly Kannan had to do something quickly or he would be at risk for diabetes and heart disease. Every year Kannan makes some kind of sacrifice for 41 days. What started out as a religious and spiritual routine based on the Indian lunar calendar, ended up as an annual self-improvement ritual between November 1st and December 11th. One year he gave up rice, a key staple of the India diet, and all other grains except oats. Another year he ran twice a day, every day for 41 days. This past year he called me and told me he was interested in going on a 41 day raw food diet. Luckily I had quite a few raw food recipes on the Foods For Long Life blog so he had plenty to choose from. He and his wife modified some of the recipes with more familiar Indian spices and ingredients. Before his 41 day raw food diet, Kannan would typically start the day with oatmeal or a Dosa (an Indian crepe made from rice and lentil flour). For lunch he’d enjoy rice and vegetables. Afternoon snacks were typically deep fried Indian treats and dinner was comprised of Indian bread or rice with a vegetarian entrée. When he ate out, which CEOs often do, he admitted he indulged himself in rich and unhealthy foods. During his 41 day raw food diet he would start each day with a fruit and vegetable smoothie or raw fruits in chia pudding or yoghurt. Lunch would be a nice big raw organic salad with tomatoes, dried fruit and nuts. He would snack on fruits, nuts and either soy or hemp milk or raw goat milk. For dinner he would eat raw vegetable soups based on the blog recipes but he would add some Karela (bitter gourd or melon known in Ayurvedic practices to help lower blood sugar) or Methi (Fenugreek seeds, also common in Indian cooking and known to help treat diabetes and reduce cholesterol). He also added turmeric (long known for its anti-inflammatory properties) to most recipes and some days his wife would sprout some beans for his dinner (I hear she is a master at sprouting!). I really like the way he added familiar foods and flavors to my recipes. Technically he wasn't 100% raw but adding a few non raw items like soymilk and yoghurt helped him succeed. After 41 days, Kannan lost 27 pounds, over 16% of his body weight. This gave him a healthy BMI of 23.1. His lost 3.5 inches from his waist and went from a 37.5 inch waist to a svelte 34 inch waist. After only 24 days into the diet, Kannan had some blood work done. Even with 17 days to go, the results were quite impressive! Total cholesterol went down 24%, from 201 to 153 mg/dL putting him in the low risk category from “borderline high”. LDL was reduced 20% from 122 to 97 mg/dL moving him to “optimal”. HDL increased 10%, from 40 to 44 mg/dL. This improved his Total Cholesterol/HDL ratio from 5.0 to 3.5 which moved him very close to the “very low risk of heart disease” category. Perhaps the most stunning result was a 69% reduction in his triglycerides. His last reading before the diet was 193 mg/dL and after on 24 days it was down to 60 mg/dL. This is well below the 150 mg/dL threshold. Fasting blood sugar dropped 20% from 146 to 117 mg/dL, still a bit high but much improved. In the beginning, he felt hungry and got headaches towards the evening. This improved after a few days. (Headaches are common as the body starts a gentle detox from the purity of the diet.) The time for food preparation was something he had to get adjusted to and plan for. Sufficient snacking and drinking enough water was key. It was also a challenge when he went on a business trip and had limited options in restaurants. Needless to say, both Kannan and his wife were thrilled with the results. He commented that none of the other 41 day fasts and exercise programs had ever produced results as impressive as this. Kannan no longer requires any medication. Before you start a raw food diet or adjust any of your medication, talk to your doctor. You may not experience the same results as everyone’s body and metabolism is different. Now that I’ve reminded you of that, I will tell you that this is certainly not an isolated incident. Go to any raw food potluck and hear other examples of improved health. Do You Want to Try a Raw Food DIet? If you (and your doctor) decide you want to try a raw food diet for a week or a month, check out my many raw food recipes and articles. Remember, adding raw plant food to your diet, whether it's just a few fruits and vegetables a day or it's a 2 to 3 raw meals a day, adds healthy enzymes, fiber, phytochemicals, vitamins and minerals to your diet while providing an optimal pH balance for your body. Sauté the red bell pepper, red onion and shitake mushrooms. A brown rice crust is easy to make and is low in calories and fat. Sprinkle with 2 tablespoons of shredded parmesan and bake. After baking 45 minutes at 375 degrees, let sit for 10-15 minutes. When some people see the word "broccoli" or "vegetable" in a menu item, they often get the false impression that the dish is healthy. With vegetable quiche dishes, nothing could be further from the truth. That's because most quiche dishes made in a restaurant are prepared with butter, heavy cream, full fat cheeses and lots of eggs. And that's just the filling! The crust is generally made from refined white flour and butter or lard. It wouldn't be hard for a slice of restaurant quiche to be over 600 calories and contain 40 to 50 grams of fat. I was very excited to find ready made, whole wheat and spelt crusts at Whole Foods. At first glance, I thought that would be a healthy choice for my crust. After reading the label, however, I was surprised to find out that one crust contained almost 900 calories, 64 grams of fat and 32 grams of saturated fat. Even though the saturated fat was from "tropical" oils and contained zero cholesterol, I was still put off by the amount of total fat and calories. I found a few recipes that made a crust using a mixture of cooked rice and eggs and was very pleased with the results. To step it up a notch, I used brown rice and an egg white. The resulting crust had half the calories and 1/16th the fat of the ready-made whole wheat crust. It wasn't as convenient as pulling it out of the freezer but it was still pretty easy to make and certainly worth the effort. You can lower the calories and saturated fat and still get a very nice consistency by using reduced or low fat cheese instead of full fat cheese. In this recipe I use low fat cottage cheese and reduced fat swiss or cheddar. You can also replace cream with soy milk or fat free evaporated milk. To further reduce the calories and cholesterol, you can replace one of the eggs with 2 egg whites. The flavor created by adding a few tablespoons of high quality parmesan on top will give the impression that all of the dairy ingredients are rich and decadent and no one will realize that you've made these healthy substitutions. There is no need to fry the vegetables in loads of butter. Steam the broccoli and lightly sauté the onions, peppers and mushrooms in a few teaspoons of olive oil. The following recipe uses all of these techniques and weighs in at around 300 calories a slice with14 grams of fat and only 4 grams of saturated fat. It also provides around 20 grams of high quality protein and almost 7 grams of fiber. That's pretty healthy for a quiche. A veggie quiche is great to serve at a brunch or shower. Serve with roasted baby potatoes, a big fruit or raw green salad and, for a special treat, Mimosas (a flute filled with half champagne and half orange juice). Enjoy! Preheat oven to 400 degrees F. Combine cooked brown rice, egg white, and a pinch of salt and pepper in a small bowl. Lightly grease a 9 inch pie pan. Press the rice mixture into the bottom of the pie pan and up the sides. Bake for 8 to 9 minutes until it "sets". Remove from oven. LOWER THE OVEN TO 375 degrees. Steam the broccoli until fork tender and separate into small pieces. Remove from heat and let cool. Sauté the onion, bell pepper and shitake mushrooms until they soften, about 8 to 10 minutes. Remove from heat and let cool. Place the eggs and egg whites in a mixing bowl and lightly beat. Add the milk, cottage cheese, shredded swiss or cheddar cheese, salt, pepper, thyme and parsley and mix thoroughly. Add the cooled broccoli and sautéed vegetables and mix well. Pour mixture into the baked rice crust and top with parmesan cheese. Bake at 375 degrees for 45 minutes or until you can gently shake the quiche and it doesn't wiggle. Remove from oven and let sit for 10 to 15 minutes before serving. Per serving: 304.1 calories, 13.9 g fat, 4 g saturated fat, 119 mg cholesterol, 19.8 g protein, 33.2 g carbohydrates and 6.6 g of fiber. Raw Food Diet - How Raw Do You Need To Be? What Does It Mean To Be 80% or 100% Raw? Remember the popular ice-breaker, “What’s your sign”? Well, if you’re going to your first raw food potluck, you’ll certainly be asked a different but equally popular question? “How raw are you”? The person asking you will most likely feel that 100% is nirvana and if you are consuming anything less, you are still on your journey. You may see some people avoid a salad because it has a small amount of balsamic vinegar (which is not raw). Not all raw foodists are this strict, of course, but when you run into them it may cause you to have one of several reactions. It might make you think that you have to be 100% raw or you won’t get any of the magical benefits of raw food and you go home and remove all cooked foods from your pantry. Or, you may leave wondering if you can really stick to such a restrictive diet and give up on your goal to eat more raw food completely. First, raw food is alive and rich in enzymes which studies have shown survive the digestive tract. These enzymes help your body digest the food without producing its own enzymes (or at least producing less of them). Given the body expends much of its energy producing enzymes that digest food, you can see what an advantage it would be to save your body from this task. Second, many vitamins are destroyed by the cooking process. Raw food delivers a higher percentage of these heat sensitive nutrients to your body. Third, the alkaline nature of a raw food diet allows a more optimal pH balance for the body. You can get many of these benefits every time you eat raw food even if you aren't eating raw food exclusively. Here’s my method of calculating how much raw food I eat. I break the day down by meals, snacks and an evening dessert. (If I skip any of these meals or snacks I weight the other meals and snacks more heavily). If a meal or snack is only partially raw, like a salad topped with cooked beans, the meal is given "part credit" depending on calorie density or volume of raw food. You can use your own judgement - no one is grading you on this. For example; If you ate a raw smoothie for breakfast, you'd give yourself 25% but if you used all raw fruit, raw spinach, raw flax oil and 1/2 cup of organic soy milk, you may only give yourself 20% because the soymilk isn't raw. A 100% raw food vegan diet does not provide all the nutrients you need. (See my article, Raw Food Diet, Is it Enough). You cannot get vitamin B12 from plants. If you are 100% raw (vegan), you will have to take supplements or eat non-raw food. This is very important because you can suffer serious diseases from B12 deficiency including megaloblastic anemia and severe nervous system disorders. Example food sources of this vitamin include Red Star nutritional yeast, clams, trout, salmon and organ meats. Vitamin D is another extremely important vitamin that cannot be obtained in sufficient quantities from a 100% raw food diet. Although the body produces it from the sunshine, depending on where you live, the color of your skin, how often you are outside and other factors, there’s a very good chance you are not getting enough vitamin D. Many experts are now saying we need over 1,000 IU per day which makes getting enough a bigger problem. Supplementing with this vitamin is key considering the amount required. I just raised my daily supplementation to 2,000 IU per day. Food sources include oysters, herring, fortified orange juice or soymilk and mushrooms. (You may want to get your blood tested to find out your vitamin D level). Other vitamins that are possible (but difficult) to get from a 100% raw food diet and require very careful planning are: Vitamin E, B2 or riboflaven, calcium, iodine, iron, zinc and the amino acid, methionine. Another reason to eat cooked foods is to more easily consume beans and grains. I’ve noticed that many raw foodists eat less beans and grains than regular vegans or vegetarians. This is probably because it takes days to sprout and soak these foods to make them edible. Cooked beans are a great source of high quality protein and fiber and are much more convenient and versatile than sprouted beans. They are also a great source of molybdenum, folate, iron, magnesium, potassium, copper and thiamin. Cooked grains are also a great source of fiber, several important B vitamins(thiamin, riboflavin, niacin and folate) and minerals like iron, magnesium and selenium. Just remember to soak the beans and grains before cooking in order to reduce their phytate level. Soaking and rinsing will make their minerals more bioavailable. Eating a 100% raw diet is very restrictive and can be socially isolating. I’m not suggesting you eat an unhealthy diet so that your family and friends don’t avoid or make fun of you. I’m just saying that being more flexible about what you eat when you leave your house can improve the quality of your social life. Lastly, some times you just want a nice hot meal. I’m headed to visit my daughter in Minneapolis in early February. If it’s cold and snowy, as I suspect it will be, you can bet that I’m going to make us a big pot of hot soup. Our bodies often tell us what it needs. Sometimes we crave foods because we are deficient in a certain nutrient. In the summer we want to eat light meals with lots of raw fruits and veggies. In the dead of winter our bodies often crave hot soup, veggie chili and home baked breads. Strict raw foodists say you can warm your bodies with warming foods and herbs like cayenne, ginger and cinnamon but sometimes that doesn’t always do it for me. Here is a plan that I have developed for myself. It goes by season, not calendar month since parts of the world experience “summer” at different times. If you live in the tropics, it’s always summer! Winter - I eat about 30 to 40% of my food raw. If I go on a vacation to a warm climate, I eat more raw food, usually mimicking what I do in the summer months. Spring – I work myself up to about 50 to 60% of my diet being raw. I pick one month in the spring, usually May or June, and do a “30 day raw food cleanse” where I eat at least 90% raw food. Summer – With the garden flourishing, I like to eat a diet of at least 70% raw food. Fall – As the weather gets colder, I drop back down to eating 50 to 60% of my food raw. This plan works well for me because I'm at a healthy weight and I’m free of any life threatening disease. If any of that changed, I would immediately increase my intake of raw food to my "summer levels" of 70% or more. I’ve seen raw food diets heal people and allow them to stop taking medication for depression, blood pressure, diabetes, high cholesterol and other ailments. A diet high in raw food also can facilitate rapid weight loss. But if you are relatively healthy and happy with your weight, a plan like this one gives you many of the benefits of a raw food diet while giving you the versatility to eat other nutrient dense foods to round out your diet, warm your body and soul and allow you to more easily socialize with your family and friends. Like any diet or exercise regimen, talk to your doctor to see if a raw food diet is right for you. Cabbage is a powerful vegetable when it comes to health benefits. Like its relatives broccoli, kale, Brussels sprouts, collards (and others), it is a cruciferous vegetable. Studies have shown that this class of vegetable reduces cancer risk more than any other vegetable. Studies have shown cabbage and other cruciferous vegetables are associated with lower risk of prostate, bladder, stomach, colorectal and lung cancer. The good news is that you can get benefits from eating only 3 to 5 servings per week. Raw cabbage is also loaded with vitamin C and K and is a very good source of folate and fiber. Thyroid Function Could be a Problem - Raw Foodists Beware! Eating too many raw cruciferous vegetables can be a problem if you have hypothyroidism or a low production of thyroid hormone. Cabbage and other raw cruciferous vegetables contain "goitrogens" which contain thyroid inhibitors. So if you have an under-active thyroid, you may want to limit your consumption of "raw" cabbage or you can also steam these cruciferous vegetables to avoid the issue and get the benefits. If you have this problem and want to limit your raw cabbage consumption, substitute lettuce in this recipe. The ginger tahini vinaigrette makes a wonderful salad dressing. Some of the symptoms of hypothyroidism include fatigue, muscle aches, unexplained weight gain, pale, dry skin, intolerance to cold, constipation, depression, and brittle fingernails and hair. Some common causes of hypothyroidism include autoimmune disease (Hashimoto), over-treatment of hyperthyroidism, radiation therapy, thyroid surgery and some medications like lithium. From a nutrition point of view, I have seen underactive thyroids from iodine deficiency. Iodine is a trace mineral found in seafood, seaweed and iodized salt. Many people don't eat seafood and have stopped eating iodized salt. At the same time, chlorine and fluoride are commonly added to our drinking water. These chemicals have similar chemical structures as iodine and some theories say they may displace iodine in the thyroid which could lead to hypothyroidism. I have resumed my consumption of iodized salt "just in case". Many Asian vinaigrettes have tahini (sesame paste) and sesame oil which both contain high amounts of omega 6. As healthy as omega 6 is (it's needed for cholesterol metabolism, growth and reproduction), it is essential to balance it out with omega 3 (needed for cardiovascular health and brain development, a healthy immune system, reduction of inflammation and proper functioning of ALL body tissues. It's extremely important in fetal development). For this purpose I use extra virgin olive oil instead of sesame oil and a teaspoon of cold pressed flaxseed oil in this recipe. This combination provides an optimal 4:1 omega 6 to omega 3 ratio. Combine the salad ingredients in a large salad bowl. In a smaller bowl, blend the garlic, ginger, tahini and honey to form a thick paste. Slowly add the soy sauce, vinegar, oils and cayenne and mix thoroughly. Add to salad, toss well and serve. Per serving: 234.6 calories, 10.9 g fat, 1.3 g saturated fat, 0 mg cholesterol, 5.3 g protein, 31.3 g carbohydrates, 6.1 g fiber, 660 mg omega 3 and 2,640 mg of omega 6 fatty acids. These gluten free wraps are made from ivory teff and millet. Bake sweet potatoes, onions, garlic and seasonings at 425 F.
When people have celiac disease (an immune reaction to gluten that occurs in your small intestine eventually preventing the absorption of key nutrients) or wheat allergies (an immune reaction to proteins in wheat leading to symptoms such as nausea, breathing difficulties, hives and anaphylaxis), gluten must be totally avoided. Gluten is a protein found in wheat, barley and rye and is commonly found in a wide majority of breads, cereals and packaged goods. Even soy sauce contains gluten. A colleague of mine's wife suffered from celiac. She eliminated all forbidden foods only to find that her lipstick contained gluten! Eliminating this protein from your world is extremely difficult. More and more gluten free products are hitting the market. The tortillas used in this recipe are made from the gluten free whole grains teff and millet. Unlike some gluten free tortillas, they are very pliable and heat nicely. They are made by La Tortilla Factory and can be purchased at many stores throughout the country. Burritos are fun to make. They are a whole meal and there are endless combinations of food groups that can be part of a healthy burrito. In this recipe, I use a combination of sweet potatoes, yellow onions, black beans, lots of garlic and avocado. The result is a colorful dish packed with phytochemicals, vitamins and minerals as well as fiber and protein. Each burrito provides over 15 grams of fiber (half your daily requirement) and 11 grams of protein. It is also cholesterol free and low in saturated fat. For added health benefits, top with tomato salsa which contains lycopene, a potent antioxidant. Preheat oven to 425 degrees F. Combine sweet potatoes, onions, garlic, olive oil, chili powder, chipotle powder and salt in a shallow roasting pan and mix well until the potatoes are well coated. Bake for 20 minutes, turn mixture with a spatula and bake another 20 minutes. While the potatoes are cooking, heat the black beans in a small pan and stir in the cumin powder. Remove potatoes from oven and drain the beans. Heat the wraps (tortillas) until they are soft and pliable by tossing them over a flame, or in a hot grill or in a microwave for a minute covered with a towel (sorry to those of you who hate microwaves but many people still use them). Place the tortilla in a plate and fill the middle with 1/4 of the potato mixture and beans. Top with some avocado and fold up into a burrito. Top with tomato salsa if desired and serve immediately. Per serving: 506.8 calories, 13.8 g fat. 1.8 g saturated fat, 0 mg cholesterol, 11 g protein, 87.3 g carbohydrates and 15.3 g of fiber. Azamara Journey 16 day cruise through the Panama Canal. A healthy custom egg white and veggie omelette for breakfast. Or have oatmeal with optional ground flax, raisins and seeds. 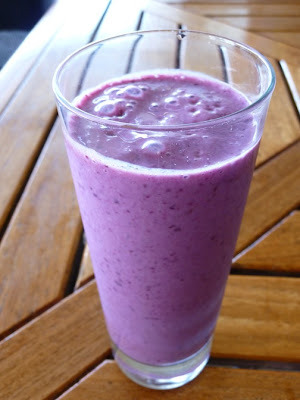 A blueberry smoothie from the custom smoothie station. A combo of different veggie and seafood salad offerings. Or make your own salad from a salad bar available all day. Fresh fruit and cottage cheese makes a nice, light lunch. You could order "steamed" veggies in any of the dining rooms. There was always a nice selection of baked fish. They offered custom stir-fries every night with fresh ingredients. Start the day with an exercise class or work out in the gym. Dancing in the New Year while burning more calories! When Doug suggested we take a 16 day cruise for our 20th wedding anniversary I was both delighted and terrified. The last time we went on a cruise or an "all-inclusive" land vacation, I put on pounds that took a long time to remove. These vacations all start out the same way. For a day or so we examine every little morsel that goes in our mouth, avoid the heavy desserts and check out the gym. After a few days we stumble into a margarita tasting or an ice cream social and by the end of the vacation we are ordering multiple entrees and eating a dessert at every meal. We hear ourselves saying, "what the heck, we're on vacation" and "it's paid for". We manage to squeeze into our largest outfit and fly home avoiding the scale for weeks and hating ourselves for losing our will power. If we take a 16 day cruise (almost twice our longest trip), we'll have to have a better plan. To take a 16 day cruise through Christmas and New Years to the Panama Canal WITHOUT gaining a single pound. My pre-cruise weight was 115.5. (1) Keep a journal and write down every calorie eaten and every calorie burned. (2) "Net" 1386 calories a day. (To maintain weight, you need around 12 to 15 calories for every pound of body weight. To be conservative I used 12 X 115.5 calories or 1386). Net calories is all calories consumed minus all calories burned. (1) Skip the bread. I told the waiter to NEVER bring bread and butter to the table. Once that beautiful basket of assorted hot bread is sitting there in front of me, it's almost impossible to resist. (2) Limit alcohol to one glass of wine or Champagne a day and try to skip some days all together (not an easy task given this cruise was over the Christmas and New Years holiday). Avoid high calories mixed drinks completely. (3) Be VERY specific about food preparation. I asked for "steamed" vegetables, "plain" baked potatoes, salad dressing "on the side", "hold the sauce", "grilled or poached" fish. (4) Avoid events that give away alcohol or fattening food like martini tastings or ice cream socials. (5) When eating buffet style, make one visit for the salad/appetizer and one visit for the main meal. Use a smaller plate. (6) Limit dessert to one small and relatively healthy one per day like fresh fruit, low fat frozen yogurt or a mini fruit tart. (7) Keep a food journal and WRITE EVERYTHING DOWN. Count all calories consumed (I brought the "Biggest Loser Complete Calorie Counter book with me). (1) NEVER take the elevator on a cruise ship. Walking up and down steps burns lots of calories. (2) Use the gym every day. (3) Sign up for exercise and self improvement classes. Azamara offered stretch and exercise classes and gave lectures on acupuncture and detox and tested for body composition. You could even hire a personal trainer. (4) Walk around the track. (5) Take the most "strenuous" excursions. Walk, hike or swim and avoid "site seeing bus tours". (8) WRITE ALL ACTIVITIES DOWN and record calories burned. Tuna or lean turkey sandwich with veggies and mustard. Even though I passed on the richer meals, the food was still amazing. With the beautiful fresh salads and fruit and the delicious selection of seafood, I didn't feel like I was missing out on anything. I ate three wonderful meals a day and a few healthy snacks in between. I didn't really know how much I weighed on the cruise. The scale in the gym varied with each wave so I had to wait until I got home to see the results. I stuck to my calorie goal and worked out every day. I felt really great. Even without weighing myself, I felt like I was in better shape than when I got on the boat. After getting home I waited a day for the "salty" food to get through my system since I knew that would hold some "water weight". But the moment of truth came the next morning when I stepped on the scale and weighed 115.5 - EXACTLY what I weighed the morning I left for vacation. Doug, who ate and drank a bit more than I did,(but also worked out more) managed to actually lose one pound. It was the best vacation we ever took. We saw the Panama canal, walked through the cloud forest in Costa Rica and released baby sea turtles to the ocean in Acapulco. We also visited Jamaica, Columbia, Nicaragua, Huatulco and Cabo San Lucas. Best of all, we didn't go home feeling badly about our loss of self control. My hats off to Azamara Cruises for offering all those delicious healthy choices. My "fear of cruises" is gone forever! As we enter a new decade, I reflect on how quickly time passes. This summer I'll turn 62 and besides the joy of collecting my first social security check, i feel fortunate that I still feel really young and I'm able to do pretty much anything I could do decades ago. Luckily for us, our body regenerates itself, constantly replacing old cells with new ones. We get to choose how good we feel and how healthy we are by providing our body with the proper fuel and materials. If your body regenerates new cells from potato chips and beer you won't be as healthy as if it builds new cells from organic fruits and vegetables. Sounds obvious but most of us aren't usually thinking about food and drink as "fuel" for cell regeneration. The good news is that even if you've never taken care of yourself, it's not too late to make some changes. If you woke up face down on New Years Day vowing that you were going to take better care of yourself in 2010, here are some suggestions for you. Last year I gave you a list of 10 things to do to improve your diet in 2009. Looking at the list, I still stand by all the recommendations but this year I'll make it simpler - just THREE things. Don't eat out of a box. Packaged food is usually full of processed, nutrient-free food that may be full of salt, sugar, unhealthy fats and unpronounceable preservatives and food colorings. Prepare your own food. Eat a healthy breakfast at home, pack a lunch and cook a simple dinner with your loved ones while unwinding from the stresses of the day. I've provided you with over 120 healthy recipes in 2009 made from fresh, whole foods packed with fiber and vital nutrients. Besides diet, exercise is the best way to turn back the clock, lose weight and significantly reduce the risk of disease. This morning's Wall Street Journal's Health and Wellness section reported that besides boosting the immune system, exercise can "lower the risk of stroke by 27%, reduce the incidence of diabetes by around 50%, reduce the incidence of high-blood pressure by around 40%, can reduce the risk of recurrent breast cancer by 50%, can lower the risk of colon cancer by over 60%, can reduce the risk of developing Alzheimer's disease by approximately 40% and can decrease depression as effectively as Prozac or behavioral therapy". These are shocking statistics! With these amazing numbers, I would think everyone would happily start an exercise regimen. Check out the Physical Activity Guidelines for Americans issued by the federal government in 2009. More and more is being written about the importance of Omega 3 fatty acids and vitamin D in the prevention of disease. Omega 3 reduces inflammation and is key for brain development, proper immune function, a healthy cardiovascular system and preventing joint pain and depression. Best vegetarian sources of ALA omega 3 are English walnuts, flax seed and oil, chia and hemp seeds. Seafood and high quality fish oil capsules are the best sources of EPA and DHA omega 3 fatty acids. For more details on best sources and how much is needed, see my July 31, 2009 post on Best FIsh and Vegetarian Sources of Omega 3 Essential Fatty Acids. Check out all of my Articles and Recipes on Omega 3 including my popular chia pudding recipes. Although there are many studies contradicting the benefits of popular supplements, more and more studies are extolling the benefits of taking Vitamin D. This vitamin has long been known for its importance in calcium metabolism and bone health. Recently there have been two important discoveries. One, most people are deficient in vitamin D, and two, deficiency has been linked to cancer, vascular disease, increased susceptibility to colds and flu and chronic inflammation. And although the RDA for this vitamin is only 400 IU, experts are now recommending 1,000 to 2,000 IU's daily. Even though the body makes vitamin D from exposure to the sun, you may not be getting enough unless you are caucasian working outdoors and living near the equator. Other sources of vitamin D are from fortified milk and orange juice, seafood and mushrooms but again, it is very difficult to get sufficient quantities of vitamin D from food so supplementation is very important. D2 is the vegan form of vitamin D and D3 is derived from an animal source (like sheep's wool). May I also remind my raw food vegan friends to supplement with Vitamin B12 and to plan their nutrition very carefully. For more information on this read my post on Raw Food DIet - Is it Enough? Make this year the best and healthiest year of your life. And thanks for letting me be part of your journey. Happy New Year! For my 2009 recommendations, read The Top 10 things you can do to improve your diet in 2009. Please consult your physician before you begin a new diet regimen or exercise program.